Amongst the flood of mostly mediocre and derivative nu-metal bands that have poured forth in the last few years, Static-X stands out. This is a group that has carved out its own identity and whose style has become recognizably unique. That's not to say that they are doing anything radically different...one can certainly hear influences from Ministry,White Zombie and Fear Factory in their music...but they have mutated their inspirations into a "Static-X" sound. Their debut "Wisconsin Death Trip" established the ground rules.The sound was definitely heavy metal, but mixed with samplings, techno beats and industrial leanings. Despite the abrasive nature of the material, there was also an admirable smoothness and catchiness to it. Songs latched onto your brain waves and did not disengage easily. That songwriting continues with "Machine" but the aggression factor has been upped noticeably. The band seems to be experimenting more with sound textures, as the guitar sounds vary from track to track, helping create more individuality. They also seem to be monkeying around with the sampling and electronics more. Those elements are subtle but reinforce and bolster the tracks remarkably, such as the minimal keyboard sounds that give "Cold" much of its haunting melody. Wayne Static's voice is rougher in most spots, like "Get to the Gone", but he can vary his tone, also, making him a talented and underrated frontman. Thankfully, a lot of the rap overtones in the vocals that were on "Wisconsin..." have been dropped. That's another sign that this band knows what they are doing and know when to abandon a dead end. If "Machine" suffers from anything, it's a letdown in the second half. Much like "Wisconsin...",all the best stuff comes early. By the time "Machine" wraps up with the title track and the exceedingly odd "A Dios Alma Perdida", you are left with a pretty unsatisfying climax. The band still needs to learn how to write a complete album. 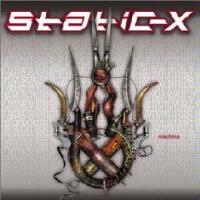 Neverthless, "Machine" proves Static-X is here to stay and is one of the leading lights of metal in the new millennium. This brief intro sounds like it was recorded at a cheap Mexican restautant,bcomplete with accordions and whooping. YOW! The record blasts off with a track more aggressive by far than anything on the last album. You can really hear the death metal influences in those opening riffs and Wayne's screams are corrosive enough to eat a hole in your head. This is ripping cyberthrash at its best! Another corker of a track, this is more mid-paced but extremely catchy. The real surprise is the soaring,u pbeat chorus with its wall of guitar. This cut swings through a variety of riffs and all are good. This has a pretty harsh guitar sound to start and goes into the typical chugging Static-X mode, with Wayne almost chanting his vocals in tribal fashion. It is based on simple phrases that stick in the brain. The chorus is pretty heavy stuff. The first single seems to be "Machine's" answer to "Stupid", from the first album. A real fast-paced belter, this is sure to get the pit moving. It is short and to the point, and a good track! I don't have a clue who or what Otsego is but he must be one mean b*! This is probably my favorite track. It's so simple, it's brilliant. I'm sure the main riff has been done before but never better. The weird keyboard frills really help the track stand out. Here's one where Static-X's deceptive songwriting comes to the fore. Like "Otsego Undead",the riff underlying the song is extremely simple, but the eerily melodic keyboard touches and Static's distorted, almost whispered vocals give the song a totally appropriate glacial mood - very subtle indeed. This chugs along fairly well and seems to be the most "rock and roll" of all the tracks here. Still it is nothing earth-shattering, that's for sure. Surging metallic guitar creates an undercurrent where Tony Campos' very heavy bass can do its dirty work. It is a thumping track definitely driven by the rhythm players.I think the chorus was just a wee bit too complicated for its own good. The band's energy starts to fail here. This is a fairly routine, vaguely commercial track where Campos' bellowing vocals mesh with Static's. Pretty disappointing for a title track, this cut is stripped down to the bare bones. This is mostly a bass-and-drum oriented track which lacks the memorable riffing that is Static-X's trademark. Wayne's robotic vocals merely seem annoying here. The album wraps up with this very strange instrumental. More like a soundtrack excerpt than a coherent song, it begins with what sounds like an old drunk talking backwards before revealing a very doomy,heavy riff. There's then some tumbling piano work and the whole sequence repeats. The track ends with feedback and almost two minutes of a strong electronic pulse. It beats me.